To date all books on geothermics have emphasized its use for generating electricity, with applications of lower grade resources for direct heating meriting only a brief chapter. 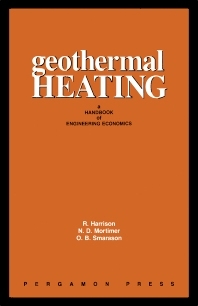 This book brings together research from a range of scientific journals and 'grey' literature to produce the first comprehensive text on geothermal heating. Economics form an important part of the book. It provides a step by step analysis of the various ways in which thermal waters can be used to provide space heating and of the advantages and disadvantages of different approaches. The final section of the book provides case studies of 31 geothermal heating schemes in France, USA and Iceland. For energy and civil engineers. Foreword. Introduction. Part I. Analysis of Surface Systems. Patterns of heat demand. Primary heat exchangers in geothermal schemes. Room heaters in geothermal schemes. Heat pumps. Heating networks: layout and operation. Heating networks: analysis of network temperatures and flows. Costs of heating networks. Geothermal heat supply calculations. Part II. Subsurface Developments. Well drilling. Geothermal fluid production. Part III. Geothermal Economics and Case Studies. Methods of appraisal. Market aspects of geothermal developments. Pre-feasibility assessment of the Garges schemes. Sensitivity studies of geothermal economics. French geothermal schemes. Geothermal heating in the USA. Geothermal district heating in Iceland. Appendices. Index.